The Golestan Palace is a 19th century royal residence in Teheran, built by the Qajar dynasty. It combines traditional Persian architecture with western influences. The buildings were once enclosed within the mud-thatched walls of Tehran's 16th century Historic Arg (citadel). 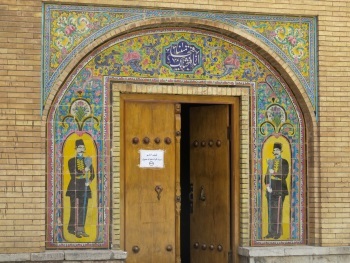 The palace was rebuilt to its current form in 1865 by Haji Abol-hasan Mimar Navai. Golestan Palace is the most recent construction on the timeline of Iranian WHS, dating from the 19th century Qajar dynasty. It also is possibly the only real attraction of Tehran - a metropolis of 10 to 15 million inhabitants. Because of its location in the capital’s city center, it is the most visited Iranian WHS among our community after the ones in Esfahan. Still this results in only a meagre 696th spot overall. Despite its relative fame, the palace is not so easy to find for an individual visitor. It lies just off a main boulevard, and is completely surrounded by much higher government buildings from the 1960s and 70s. 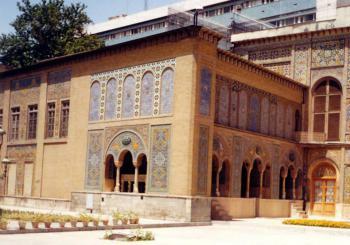 The construction thereof by the government of the last Shah was made at the expense of older buildings belonging to the Golestan Palace (such as a theater). When you finally find yourself at the entrance gate, there’s a big decision to make: how many of the 8 buildings/museums warrant a visit? Because on top of the 2x 150,000 Rial entrance fee to the grounds and the main buildings, there are additioneel fees of 80,000 each for the others. I decided to settle for 3 extra tickets: to the Building of the Windcatchers, Edifice of the Sun and the White Palace. It turned out that the actual tickets do not mention a specific building, so in the end you can always switch to another one if that appears more interesting. I first did a full lap around the palace grounds to photograph the lovely tiled exteriors of many of the buildings. There are fierce Mongolian-type warriors, European-inspired landscape motifs, funny men in Persian (or Turkish?) uniform and even portraits of two women with deep cleavage (“no mullahs at the time”, I overheard an Iranian guide saying). The two most beautiful objects however I found the two yellow-white marble artworks that are exhibited half in the open air: the huge Marble Throne (no longer hidden behind a curtain) and the tomb of Naser ed-Din Shah. I wasn't too charmed by the additional buildings that I entered and had bought the separate tickets for. The White Palace now is in use as an ethnographic museum. It is advertised as "one of the most interesting ethnographic museums of Iran", but there’s not very much to see except some traditional costumes. The Building of the Windcatchers was very disappointing. I had already seen a functioning badgir 5 years ago in Bahrain: they are meant to 'catch' the wind and turn it into natural ventilation in a building. Unfortunately here in Golestan you cannot enter the the towers itself. I quietly walked around for two hours, and occasionally sat on a bench for some people watching and to enjoy the peaceful atmosphere. The palace has a large courtyard / garden (even with a café with terrace!). My feelings about this WHS are mixed: the many halls are clearly European-inspired and often very flashy, with lots of mirrors and 19th century furniture. But these strangely tiled walls I found very fascinating and unique to Iran. The most unusual elements at the Golestan Palace grounds date from the reign of Naser ed-Din Shah (1848-1896), the first modern Persian king who visited Europe. He also introduced other Western innovations in the country, such as postal and telegraph service, a newspaper and infrastructure and education in western style. He wrote a very enjoyable travelogue about his visit to a number of European countries in 1873, called ‘Diary of H.M. the Shah of Persia’. He travelled from royal court to royal court, from Russia via a large U-turn (even reaching England) to Turkey. He also showed amazement about technical novelties such as iron bridges, tunnels (“holes in the mountains”) and pedestrian paths. My visit to the Golestan Palace got off to a bit of a rocky start. It was 15 minutes after 'opening' time, and while there was already a line of foreign and local tourists waiting to go in, the man at the desk resolutely ignored everyone. Eventually, another man appeared, 'coincidentally' at the exact same time as a large French tour group, to start issuing tickets. He seemed offended when I wanted to be served before them, even though I'd been in line for 20 minutes. The ticketing process itself is pretty arcane. Base entry price (circa April 2016) was 150, 000 rial (5USDish), a ticket to see the main attractions (the throne, hall of mirrors, etc) another 150, 000, and eight (!!!) other rooms (such as Persian paintings, European paintings, royal gifts) each costing 80, 000 and requiring their own printed ticket. The total price for everything was 940, 000 rial, or something like 30USD. I declined this offer, and settled on the two main tickets. The garden area is pleasant enough, but not spectacular. The ornate throne room is covered by scaffolding and a large fabric curtain, but the guards did not mind me peeking my head and camera through the middle. I've seen perhaps too many European palaces in my time to still be enthused by opulent room interiors, and the Golestan Palace isn't really an exception. It was explicitly inspired by a visit from.the Shah to Versailles, and is inscribed for its nature as a Persian adaptation of European art and architecture, so it felt pretty familiar. My favourite part was the painted tilework on the garden walls, with many regal boys with very bored-looking faces. The loudspeakers blaring what I assume to be inspirational nationalistic music was fun too. For most overseas travellers Tehran is inevitable in Iran, being the most likely entry pont and central transport hub. But the notorious traffic jams and dull concrete blocks make you feel like leaving the city as soon as possible. In other parts of the world "bustling nightlife" could outbalance the architectural disadvantages - but in the Islamic Rapublic amenities are limited to some pizzerias (forced to close if they play Western music too loud), traditional tea houses (can be fun once), cinemas (playing Iranian movies in Persian), and family picnicks (not for tourists unless you are invited). What brings some - not too much - light into this grey concrete town, is the imperial past. The palaces are must see, as well as the tresury of the National Bank, where the crown jewels are deposited. As before the 18th century Tehran did not play an important role in the history of iran, the palaces are also quite young. Saadabad, the luxury hideout of Mohamed Reza Pahlavi, the last shah is a glitzy mid 20th century villa, that reflects the sophisticated taste and glamurous lifstyle of Farah Diba. Golestan Palace is different. It was originally a regional royal residence built within the mud thatched walls of Theran. The major works begun with the rise of the Qajars at the end of the 18th century. Though it is not really old, its style reflects the age old Iranian traditions. Desptie the growing French and Russian influence in Iran the lifstyle of the monarchs was quite alike their medieval ancestors - the shah was sitting cross-legged on a table-like marble throne surrounded by subjects sitting on cushions in the diwan. The most spectacular part of the whole building is the throne room -finished in 1806. Adorned - somtime a bit over-adorned - by paintings, marble-carvings, tile-work, stucco, mirrors, enamel, woodcarvings, and lattice windows, the throne embodies the finest of Iranian architecture. The Marble Throne is one of the oldest buildings of the historic Arg. The existing throne, which is situated in the middle of the terrace (iwan), is made of the famous yellow marble of Yazd Province. Coronations of Qajar kings, and formal court ceremonies were held on this terrace. The last coronation to be held at the Marble Throne was the coronation of Reza Pahlavi, in 1925. There are a lot of other rooms and buildings that showcase the dacadent splendour of the late Qajar monarchy. The most ornate - and somehow horrific - place is the Brilliant Hall. It was named so for it is adorned by the brilliant mirror work of Iranian artisans. The hall was built by the order of Nasser ol Din Shah in the late 1850s. In between 1925 and 1945, a large portion of the buildings of the palace were destroyed on the orders of Reza Shah. 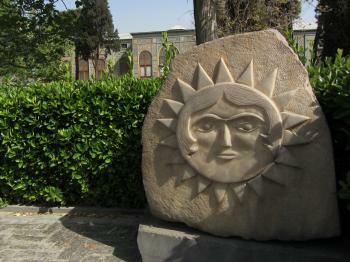 He believed that the centuries old Qajar palace should not hinder the growth of a modern city. In the place of the old buildings, commercial buildings with the modern style of 1950s and 1960s were erected. Golestan Palace lies right in the city center of Tehran, across from the Grand Bazaar and a few blocks away from the National Museum. It is signposted badly, but - coming from Imam Khomeini street - it lies on the left side and behind a small garden in the shopping street leading to the Bazaar.